Jan van Haasteren’s ‘get the cat’ is the title of this hilarious 1000 piece jigsaw puzzle that has been produced by the artist Jan van Haasteren. 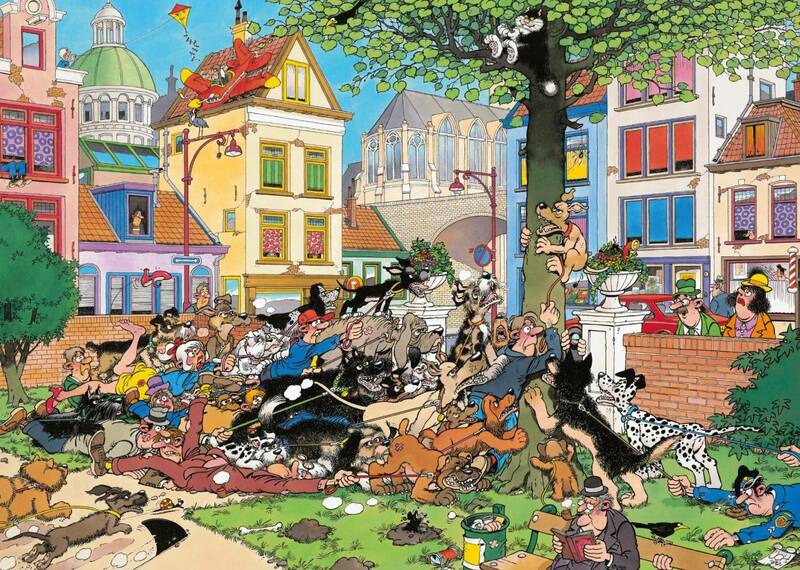 The puzzle image illustrates a chaotic struggle in the local park as all the dog walkers have been bundled together underneath a tree, as a cheeky cat teases their feline friends, who have been left barking below – and some have even tried to climb up and confront the cat in question. If this small taster of the illustrations in this puzzle sounds like your cup of tea, then don't miss out on the fun of piecing this puzzle together, because there are many more hilarious illustrations to be enjoyed. 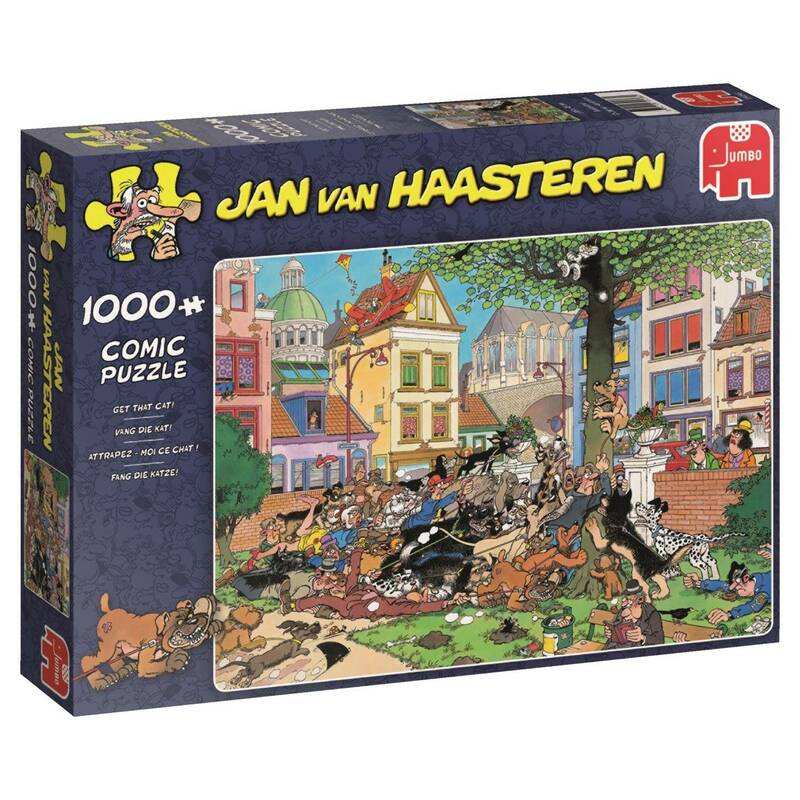 This 1000 piece jigsaw puzzle is the perfect Starter for puzzlers who may have never pieced together a JVH jigsaw puzzle before - or it is a nice addition to loyal JVH fans collections and a great travel jigsaw due to the small size and lower piece count. 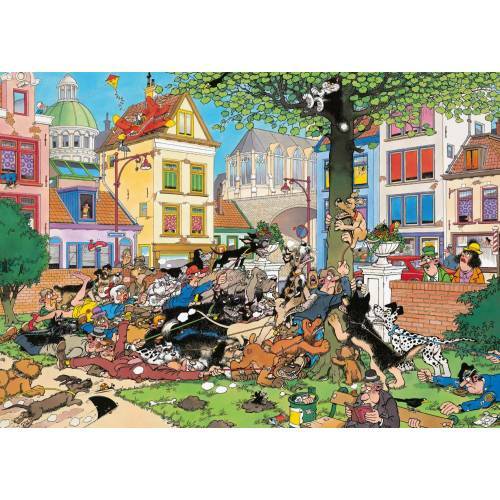 The finished size of a 1000 piece puzzle measures 68 x 49cm (approximately) and the entire jigsaw puzzle has been produced using a high quality cardboard to ensure every jigsaw piece maintains its original shape during use and has a poster-like finish. Most of Jan's fans will immediately search for his trademark - the shark's fin - featured in every puzzle. But you can also look for Jan's other favourites - Saint Nicholas, the hands, the Dentures and a self-portrait of Jan - that can be seen in nearly all of his puzzles. But if you have never puzzled a before, then you can be sure to look out for these things.